What is Tai Chi Chuan / Taijiquan? 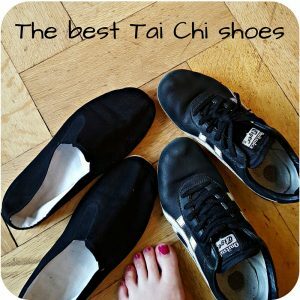 When I wanted to learn Tai Chi more than a decade ago, I started searching for Tai Chi classes. And I was confused. Because I noticed that people talked not only about Tai Chi, but also about Tai Chi Chuan and Taijiquan. And I wondered: what is Tai Chi Chuan or Taijiquan or Tai Chi or Taiji? First of all: it comes from China. It is a martial arts practice, which means you could use it for fighting or self defense. However, when I started, I was interested in improving my health and getting into meditation. And surely this training has many health benefits! But I was confused by all the different names: Taijiquan or Tai Chi Chuan or Tai Chi or Taiji. 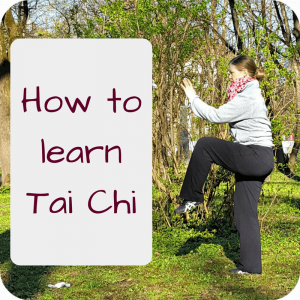 Basically, Tai Chi (or Taiji) is the short version of Tai Chi Chuan and Taijiquan. And depending on which system you use to bring this 太極拳 into latin letter, you can write “Tai Chi Chuan” or “Taijiquan”. Thus Tai Chi Chuan and Taijiquan are the same, only that Taijiquan is the “official” version (called Pinyin transcription), while Tai Chi Chuan is the older version (called Wade-Giles transcription). What is Tai Chi Chuan / Taijiquan / 太極拳? The first two signs combined – 太極 taiji – mean “the Absolute or Supreme Ultimate” or “the source of all things according to some interpretations of Chinese mythology”. Now what does that mean? I got closer to the meaning when I saw that the Yin-Yang symbol is called Tàijí-Tú! 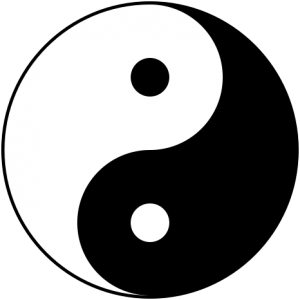 Somehow Taiji had something to do with Yin and Yang – which also explained why this symbol is in every school and on all the websites. When I combined all three signs of Taijiquan – 太極拳 – a direct translation was “Supreme Ultimate fist” or “Yin Yang boxing”. And technically that would be correct. Only now, after 10 years in the Taijiquan community, I know that many people think that this direct translation is not broad enough to fully answer the question “what is Tai Chi Chuan resp. Taijiquan”. Because to grasp what is Taijiquan, it is important to understand how important Yin and Yang are. 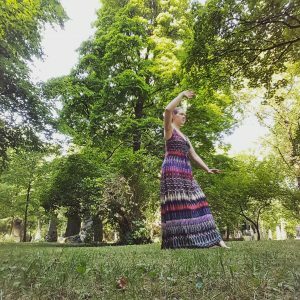 When I, as a beginner, looked at people doing Taijiquan in a park, I saw continuously flowing movements at a constant pace. But actually, these Tai Chi moves have different qualities! Like attacking (Yang) or defending (Yin). Expanding (Yang) or compressing (Yin). All these Yin and Yang qualities happen within the Taijiquan form or choreography. Basically, when you practice Taijiquan, you practice this ongoing transition from Yin to Yang to Yin to Yang to… with every move. Personally, I think that is why it is so calming. And I feel so balanced afterwards! And even though most people say Taiji or Tai Chi in every day life, the quan-part (拳) of Taijiquan is really important. 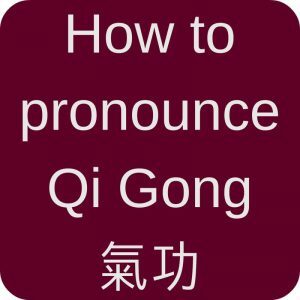 In China, they use the word “quan” as an indicator for a martial art, e.g. Shaolinquan. 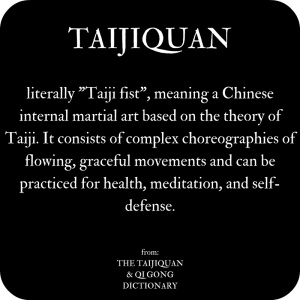 And Taijiquan is a martial art! I know, it looks so soft and flowing (it’s actually a so-called internal martial art). When you look at it, you can see many fighting techniques, kicks, pushes etc. Obviously, I wouldn’t recommend that you start Taijiquan if you need to learn self-defense quickly. But it is a martial art. And that is one of the reasons why I like it so much. I am not particularly aggressive or bloodthirsty, but fighting is basically communication. In Taijiquan you do not only think about yourself (like in Qi Gong or Yoga), but also about the opponent. Shadowboxing (another common name for Taijiquan) indicates that you fight with a shadow. One important part of Taijiquan training is to communicate/fight with a real opponent – in a really nice, soft, and friendly way, though! Personally, I learn so much about my own communication patterns during those interactions! Now, I hope I shed a little bit of light on the question “what is Tai Chi Chuan / Taijiquan”. And I understand that this may all sound strange and esoteric to a beginner. Obviously the transcribing of 太極拳 into Latin letters is a mess. But if you are intrigued by these slow, soft, balanced moves, go find a teacher near you and try it! There are so many benefits and Taijiquan is a great way to find balance in your life, to move in a very healthy way, and to connect with other people! P.S. : Just for you to know: as a beginner, you might think that all Taijiquan is the same. But it’s not. There are different styles, with Chen style claiming to be the oldest Taijiquan style and Yang style being the most popular. However, as a beginner, it is most important that you find a good teacher. You can change your style later, if you want to. 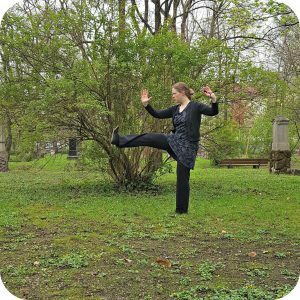 This entry was posted in Definitions and tagged Tai Chi for beginners, Taijiquan, 太极拳 on 2017-05 by Angelika Fritz.